On page 1 of the Consolidated Cutting Instructions (available with the purchased version of the pattern only), there is an error for Fabric 1 – Alternate Block. The cutting instructions for All Methods should read (24) 1½” x 6½”, not 16½”. Block 1: Step 2 on page 1 should read Foundations, not Both Methods. If you are making the blocks using templates only, follow the instructions and illustrations on the following page in the section labeled Templates. The Block 1 foundations are mislabeled on early versions of the pattern so the completed foundations don’t match the pattern illustrations. Foundation 1-2 has a slight angle on the short side. Block 12: The steps “Making the Block” are Step 3. The text references to 12-A should be to 12-C. The illustrations are correct. Diagram 5: The label “B” on the leftmost block in the fourth row down should be an upside-down “B”. The block image is accurate; it is the label on the block which should be rotated. The original pattern included an incorrect cutting layout for Fabrics 1, 4, 7 and 10 on page 7. The correct layout is provided below. The fabric yardage indicated in the pattern is sufficient to cut the required number of patches when they are layed out as shown in the revised layout. 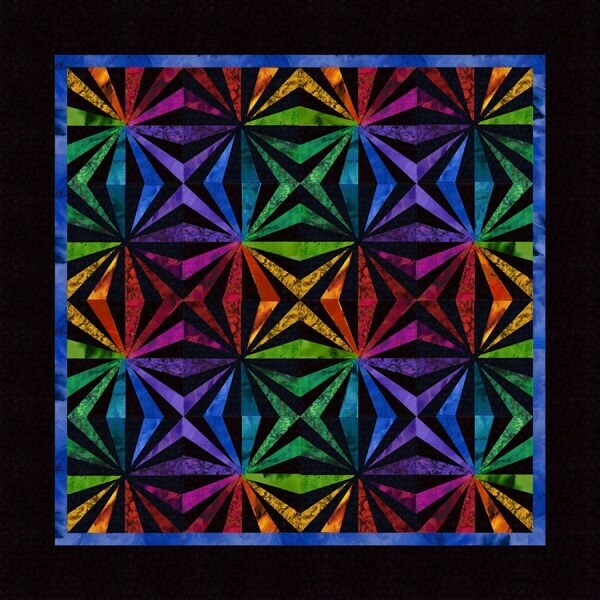 In addition, the Block B image in Step 4 and the quilt images have been refined to better reflect how the fabric points come together in the center of the block. Jinny has turned the blog over to me today so let me introduce myself. My name is Nancy Fallone and I’m half of the marketing team here at the Studio. That job keeps me behind the curtain at the Studio or at the keyboard at home working on newsletters, web specials, classes, Facebook and such but what I want to talk about today is the most fun part of my job. That would be organizing and riding on the Quilters’ Quest buses. Quilters’ Quest is our annual shop hop which encourages quilters to explore 10 area quilt shops this year running from November 9th through the 18th. For details on how the Quest works, visit http://www.quiltersquest.org/. For many, driving to each of those shops can seem a bit daunting so we offer the option of riding one of our Quest buses. As in the past, we have two buses, one on the weekend and one during the week each covering all 10 shops, each in two days. Jinny is there to greet you bright and early each morning with a continental breakfast and the chance to shop before the Studio officially opens. We then bid the Studio farewell and the true fun starts. The Material Girls always have lots to tempt us. While traveling from shop to shop, the former park ranger in me just can’t resist passing along not only information on the next shop but a bit of area history and attractions. To ensure an attentive audience, prizes are given out in our famous trivia contests. We provide beverages and snacks along with an optional bag lunch. What quilter wouldn’t smile with so much beautiful fabric and all those amazing quilts. Every shop on the Quest has a unique feel with new and different items. There are demos and special projects many using fabric designed exclusively for that year’s Quest. My favorite part of the Quest, though, is spending time with the wonderful quilters from across the country (and sometimes from around the world) who join us. I don’t know how we get so lucky to have such a great group each year. It is always wonderful to see how well everyone gets along. I recently asked one of the quilters who has been with us each year about why she keeps coming back all the way from upstate New York. Linda had seen the Quest advertised in the newsletter but didn’t want to drive it. When the bus trip started, she bribed her daughter, Belynda, who didn’t quilt or sew, into going with her by paying her way. By the second shop, Belynda was buying fabric with ideas for what her mom could make. But guess who sews now. Mom, Linda, and daughter, Belynda, never miss a Quest bus trip. Our weekend Quest bus is Friday and Saturday, November 10th & 11th (with just a few seats left) and our weekday bus is Wednesday and Thursday, November 15th & 16th. Details can be found on our website. We would love to have you join us! At the end of two days of serious shop hopping, everyone is still full of smiles. The natural disasters which have occurred during the last month have been heart wrenching. Everyone wants to make some contribution to help and the funds pouring in to the relief organizations have been very generous. But somehow writing a check does not necessarily go to the heart of our soul. Physically doing something somehow makes us feel better, as though we are sending a tangible sign of our caring. Here at the Studio, quilts from all over have been sent to us and we will be mailing the first batch of quilts next week to Austin, Texas, to the Linus Connection. One of the beautiful quilt tops we received. Diane holding a donated quilt top. We have received quilts from all over the U.S. Several of you have sent quilt tops and pre-cut squares of fabric. We have spent the last two Tuesdays at the shop making quilt tops, distributing backing and batting to people who are quilting the tops for us. We send a big “thank you” to Quilters Dream Batting in Virginia Beach for donating a large roll of batting to the cause. Marge with her finished quilt and Carole working on another. Diane putting the finishing touches on a quilt top. Pat laying out her blocks. This week I am off to visit my grandchildren. I decided this would be a perfect opportunity to let them help in the effort. We received several packs of pre-cut squares to make into a quilt. These were all sorted into bags based on design. One bag contained brightly printed squares with cats and fish on them. I selected enough squares to do a small quilt and am taking them with me so the grandchildren and I can piece them. I’ll explain about the hurricane victims and how they can help in the effort to give some means of comfort to a small child whose family has lost everything. My daughter and son-in-law also have a 17-year-old foreign exchange student living with them. What do you think my chances are of enlisting the help of this young man? I’ll keep you posted on our progress via my blog or on Facebook. We have had a lot of interest from people wanting to donate quilts or help make quilts for Hurricane Harvey victims. Our classroom space is fairly small, so if you are planning to come to help at our first Quilt-in on Tuesday, Sept. 12 from 10 to 4, we would like you to call the shop and specify what time you plan to come. Please let us know if you plan to here 10-1, 1-4 or all day (10-4). You can call us at 703-759-0250. At the shop we will work on quilts made from five-inch squares. If you have some pre-cut squares to add to the stack you are welcome to bring them. Please bring a sewing machine and basic sewing supplies. We also have limited amount of batting and backing for quilt tops you want to donate. Bring those as well so we can find the best color and size for your quilts. We have been in contact with the Linus Connection in Austin, Texas about sending the quilts to them, and this is the response we received. Our organization is geared specifically toward children from preemie up to age 17, but we will not turn larger quilts away when there is so much need. Our usual focus is comfort quilts in all sizes, but due to the extraordinary circumstances, we can take anything up to about twin size. Quilts and blankets will be distributed through the Austin Disaster Relief Network. They are sharing with both evacuees in Austin shelters as well as taking supplies to affected communities throughout the Gulf area. We’ve distributed over 200 quilts and blankets so far and have a new pile of lovely donated quilts and blankets growing for our next delivery. Thanks to all of you reading this for any help or donations. Last week we were all drawn together in unity as we stared in awe at the magic of the universe. The eclipse captured the heart and souls of our country. Not even a week later our hearts are going out to those affected by the horrible destruction caused by Hurricane Harvey. This storm will impact the lives of thousands of people in Texas, Louisiana and Mississippi for months to come. It is estimated that in Texas alone, more than 100,000 homes have been flooded. Many people will have lost everything but the clothes on their backs. We ask ourselves, “What can I do to help?” People living close to the disaster are taking clothes, food and supplies to shelters and distribution centers. Others are directly involved in the rescue operations. The vast majority of us are not able to do that. But there are other ways we can offer our support. The immediate need is money to help in purchasing food and supplies. There are several relief organizations recommended on CNN. And, of course, the American Red Cross is always prepared to help in such situations. If every one of you reading this donated at least $10, think of the impact it would make. One thousand donations would generate $10,000 in seriously needed aid. Those of you who have been to Quilt Market or Quilt Festival are very familiar with the George Brown Convention Center in downtown Houston that is now sheltering thousands of storm victims. Many people who work for Quilts, Inc. are victims themselves. While the urgent need right now is money, as the waters recede and people return to what is left of their homes there will be a need for so much more. As quilters we know the warmth and comfort that comes from being wrapped in a quilt and we can all help providing that comfort to the victims of the storm. At JINNY BEYER STUDIO we want to collect as many quilts as possible to send to those in need. As we did with Katrina, we will send those quilts to the various organizations in the affected areas that will handle their distribution. Do you have quilt blocks or tops that have been sitting around and are in need of finishing into a quilt? Maybe you already have some finished quilts that you made to donate to a worthy cause. Please bring those quilts to us and we will see that they go to a family in need. We are currently planning two “Quilt-In” days at the shop, on September 12th and 19th from 10-4. Bring your own “Harvey Quilts” to work on, or help us make some new quilts. While supplies last, Quilters Dream Cotton has donated a large roll of batting to use in Harvey Quilts and we at the Studio have set aside some fabrics that you can use for backing. These will be distributed on “Quilt-In” days. Donate a minimum of $10 to the Red Cross or other charity of your choice. Bring finished quilts to us for distribution. If you know of an organization that will be distributing household goods to those in need, please send contact information to us. If you are a long-arm quilter and are interested in donating your time to quilt some of the tops, please contact us. Watch for details on our Facebook page. I know we quilters can accomplish a lot when we work together. Thanks, in advance, for helping out. This summer seems to have flown by and as usual I have been busy with garden, family and quilting. Sadness for all of the extended family was the passing of my sister, Linda. She had fought a long battle with cancer and finally lost. But her amazing spirit through it all was an inspiration to everyone who knew her. I feel so fortunate that I was able to fly to the west coast in June and spend a quality week with her. I returned in July for another week for the celebration of her life. As usual in the summertime we start gearing up full tilt for the Shop Hop in November. 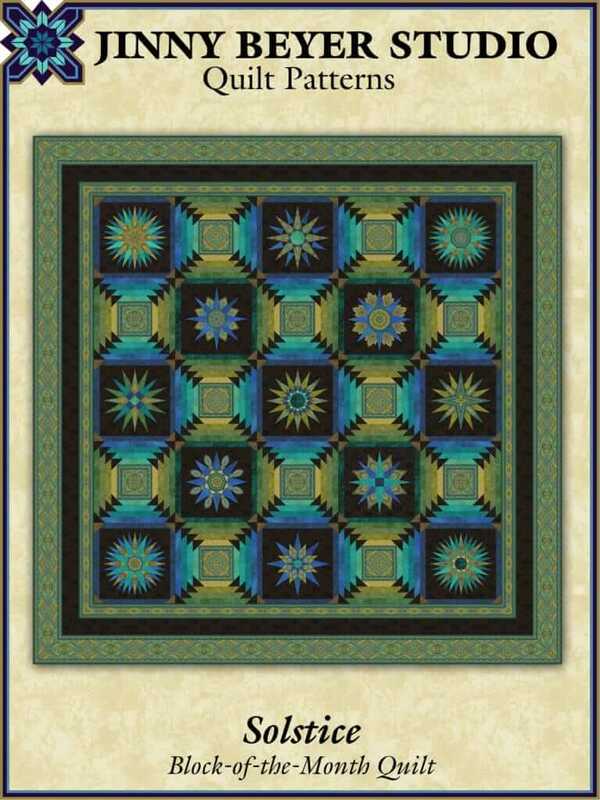 This is our annual “Quilter’s Quest” which takes place for 10 days in November from the 9th to the 18th. Each year we plan a color scheme and each shop selects a group of fabrics that fall within the range of those colors. As participants go to each shop they can purchase the swatches for $4.00 or if they spend $30 they can get them for free! This is our 2017 color palette. This year the “Quest Cuts” are eight six inch squares. We all get together and trade our sets with each other so every shop ends up with a complete set of 80 swatches. Then comes the fun part. 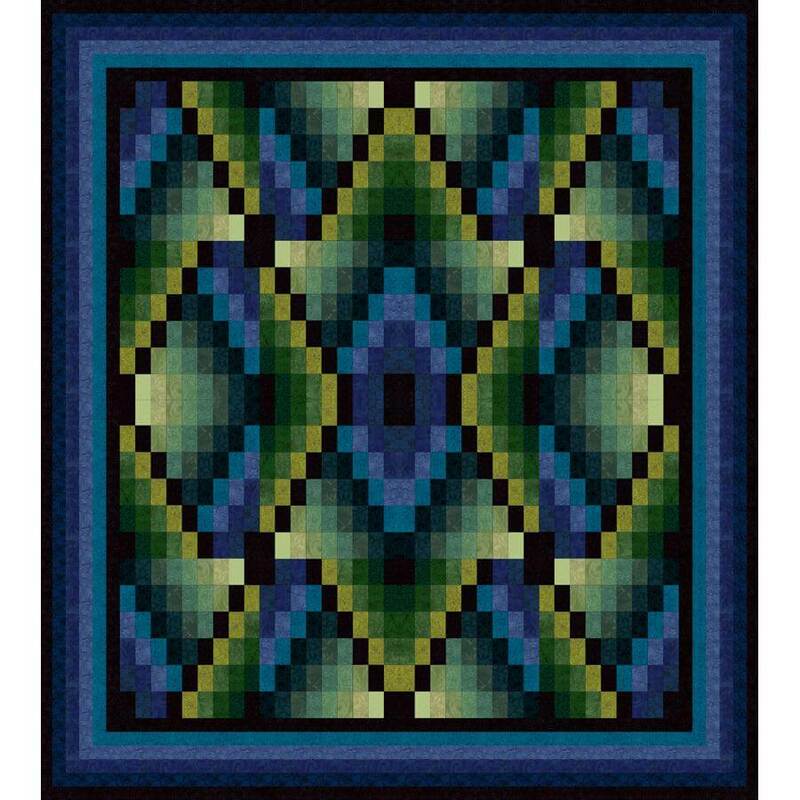 Each shop designs a quilt based on the Quest Cuts. As you go to the shops you will receive a free pattern for that shop’s quilt. Many of the shops offer “finishing kits” so that you can make a quilt from the pattern you like the best! We have decided to have a “movie” theme this year and each shop has selected a movie and will enhance their shop according to the movie they select. We chose the movie Around the World in 80 Days. It is a great event and all 10 shops have put together a fun video that tells you all about it. In the past I have shared with you the progress of the quilt as I work on it over the summer. I wanted the design of our quilt to reflect on the movie theme. The 1956 film is about a Victorian Englishman who bets he can circumnavigate the globe in 80 days. Here is a little sneak peak of the progress. You all know how much I love shading fabrics together, so that was my first task. I needed four groups with 12 values of colors in each one, going from light to dark. While the pattern for the quilt will be foundation piecing, I worked with templates, because I needed to move pieces around as I created the design. The hardest part was drafting the pattern, from there the rest was easy. Here is just a small portion of some of the pieces arranged on a design wall. It took me more than a week to get the pieces the way I wanted them and then only about a week to hand piece. The quilt is now in my quilting frame and I work on it as I watch the Washington Nationals’ baseball games. Here is a small portion of the quilting in progress. I will share the complete design when the quilt is finished.